Marcus Allen is one of the greatest NFL and Collegiate Running Backs to ever play the game. A former Heisman Trophy winner and a Pro Football Hall of Famer, Marcus Allen will long be remembered as one of the best to ever play the game at any level. His contributions to the NFL and the college game are legendary. Marcus ended his illustrious career as the NFL’s all-time leader on several prestigious lists. He played more games (222), rushed for more touchdowns (123), and caught more passes than any other running back in his era. The former MVP of Super Bowl XVIII and NFL Rookie of the Year was inducted into the Hall of Fame on August 3, 2003. Even now, Marcus Allen’s career continues to impress fans of both the college and professional level. He is arguably the best goal line runner to have ever played the game. A true Hall of Famer, his career on the field was the stuff of legends and he continues to live up to his reputation as an All-Star even in retirement. Marcus Allen is one of the greatest NFL and Collegiate Running Backs to ever play the game. A former Heisman Trophy winner and a Pro Football Hall of Famer, Marcus Allen will long be remembered as one of the best to ever play the game at any level. His contributions to the NFL and the college game are legendary. Marcus ended his illustrious career as the NFL’s all-time leader on several prestigious lists. He played more games (222), rushed for more touchdowns (123), and caught more passes than any other running back in his era. The former MVP of Super Bowl XVIII and NFL Rookie of the Year was inducted into the Hall of Fame on August 3, 2003. Marcus Allen began his NFL career in 1982 and played 16 years with both the Oakland Raiders and the Kansas City Chiefs. During that time he gained 12,243 yards rushing, 5,411 yards receiving, and scored 145 total touchdowns. At the time of his retirement he was the only player in NFL history with over 10,000 yards rushing and 5,000 yards receiving. He also set the NFL single season record in 1985 for combined yards rushing and receiving with 2,314. A six time Pro Bowl selection, Marcus Allen was a crowd favorite who always played the game with courage, tenacity, and class. 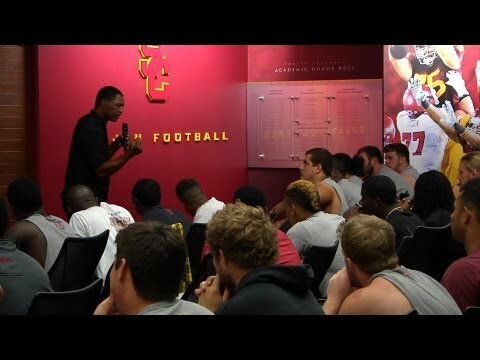 During his college career at USC, Marcus Allen caught the attention of a nation. While playing for the Trojans he became the first college player to rush for 2,000 yards in a single season in 1981. During that season he also scored a record 22 rushing touchdowns and set 13 other NCAA records. He was awarded the coveted Heisman Trophy for his accomplishments that same year. Even now, Marcus Allen’s career continues to impress fans of both the college and professional level. He is arguably the best goal line runner to have ever played the game. A true Hall of Famer, his career on the field was the stuff of legends and he continues to live up to his reputation as an All-Star even in retirement.